I led a scrappy team of Brooklyn techies to organize HackBushwick in December 2014, a 6-hour hackathon hosted by Livestream Public and catered by local businesses. We had a diverse set of 70+ attendees (including a team of high schoolers!). It was so exhausting — and really fun! This event sprang out of the Code, Drink, Talk: Bushwick meetup that I founded in 2013. It now has over 800 members. In March 2018, I designed and coordinated a pop-up event at John Jay. The aim of the event was twofold: first, promote the library in a high-traffic area outside library walls; second, obtain student feedback on a variety of subjects. For the first aim, half of a long table was deemed Ask A Librarian, where a librarian could share handouts and answer questions. The other half of the table was titled Tell A Librarian, which was covered in paper surveys and snacks (compensation). The event was a big success on both fronts. Read more about it in the library’s newsletter. As part of the John Jay at 50 Committee, I helped bring to life an exhibit displayed along the length of the college’s entry hall that showcased the fascinating history of John Jay College of Criminal Justice. My contributions were mainly in the realm of technology and design — through discussions with a committee of wonderful colleagues, I designed the exhibit itself (layout, typography, and colors). I also designed the online exhibit in the library’s Digital Collections. Both launched in August 2014. Additionally, I helped to student workers in digitizing archival materials and creating metadata for the Digital Collections. For four years running, first-years and transfer students at John Jay can take part in Escape the Library! 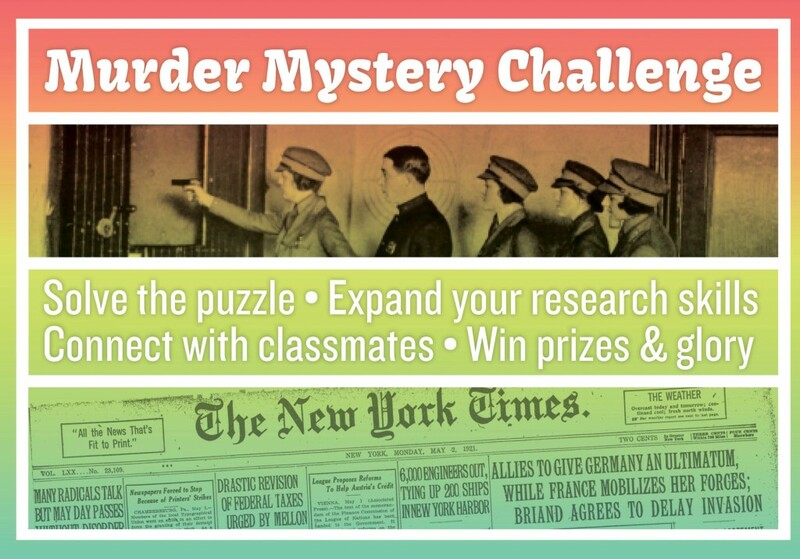 Murder Mystery Challenge, a game designed to introduce students to the library and walk them through basic research tasks. I wrote and designed the Challenge based on a real murder case, using a 1921 trial transcript in the Lloyd Sealy Library Special Collections. I collaborate with other librarians and our colleagues in the Student Academic Success Programs to organize the Challenge. Students form groups themselves and are guided through the Challenge by a Peer Success Coach, a student mentor who shares their own research tips and tricks. I created the Lloyd Sealy Library’s Instagram account and post regularly. We gained 600 followers in the first 2 years. In addition to library announcements and workshop promotions, I regularly post new acquisitions and #TBT Throwback Thursdays (photos from the John Jay College archives). I wrote about using Instragram in a library in a 2013 blog post. Along with several other librarians, I post library news and photos to the Facebook and Twitter accounts as well. We collaborate with other social media managers on campus to promote the highest-priority news items. I keep track of social media stats. I founded the CollectiveAccess User Group (NYC) in 2014 through the Metropolitan New York Library Council. This group met three times a year to discuss projects created with CollectiveAccess, development aspects related to the platform, and solutions for utilizing open source technology to manage collections. Our meetings regularly draw a crowd of folks from local libraries, archives, and museums. Developers from Whirl-i-Gig (CollectiveAccess) often attended to share new features and answer questions. In 2018, I handed the reins of the group to Whirl-i-Gig. View on Github. Ever wished the novel you were reading was way more exciting? Try my Textillating script! The user inputs a .txt file (like a novel), and the script outputs a modified version of the file wherein most adjectives have been replaced by their most extreme synonyms. In other words, the affect has been amped up. I use the VADER SentimentIntensityAnalyzer to quantify how affective a word is, and then I use WordNet to find a replacement. The script also peppers in additional adverbs and punctuation choices. View a sample output, which I’ve titled Extremely Great Expectations. See more projects in progress in my blog.